Come discover economics in the Little Rock/North Little Rock area as we go on location and find economics here, there and everywhere. Visit our event calendar at www.economicsarkansas.org to learn more. April 25 Take Me Out to the Ballgame! COOKING MATTERS: HEALTHY EATING ON A BUDGET! Dishing up a savory lunch for PreK-12 teachers! Educators attending will be taught shopping and cooking techniques to prepare delicious, nutritious and low-cost meals for their families. They will also learn how to adapt this program for their classroom or community. The economics of decision-making and money management are key to the success of this professional development. Many thanks to the Blue & You Foundation for its generous support of this program. Registration is live! Visit our event calendar at www.economicsarkansas.org to register today. Plans are underway for our two-day Relevant, Engaging, Activity-based Learning Econ for ALL conference. We will offer more than 70 concurrent, outstanding sessions for PreK-12 educators. Premier experts from academia, business and industry lead a wide variety of economic and personal finance sessions. Upon successful completion, participants earn up to 12 hours of staff development and receive grade-level curriculum choices. Registration information may be found here for Day 1 and here for Day 2. Get connected to industry by attending one of these workshops this summer. Geared for middle and high school educators, this day long training includes an industry panel, ready to use resources and an industry tour. Information may be found at this link. Check out our calendar of activities for ALL ages! Click on the graphic below to access the calendar. In honor of Financial Literacy Month, we are hosting a contest! PreK-12th grade classrooms are invited to design and create an actual savings bank and snap a photo of their savings container. 1. Email your photo (JPG or PNG format) to acee@economicsarkansas.org. One entry per classroom. Deadline to submit entries is Friday, April 19. All entries will be uploaded to a Facebook album. Voting will occur April 26-April 29. The bank photo that receives the most likes will be the winner. Guess what? You will even earn some "dough" as the winning team will receive a class pizza party! HOW WOULD YOU LIKE TO WIN $1,000? Have you created a fun, unique economic or financial literacy unit for your classroom? Please consider submitting it in our Bessie B. Moore Awards Program! Also, join us for a live webinar on April 18. PD AND A TOOLKIT TO TEACH ACT 480! We are pleased to partner with the Arkansas Securities Department and the Federal Reserve Bank of St. Louis to provide professional development and a toolkit to teach Act 480 and Act 466, the revision to section C of Act 480. Check out our event calendar or your local coop for dates and locations. We are finalizing dates and locations for our summer entrepreneurship conferences. We will host one event in Pine Bluff on June 14 and several events in NWA. Stay tuned for dates and locations. We are excited to share our resources for our latest elementary family financial literacy selection. 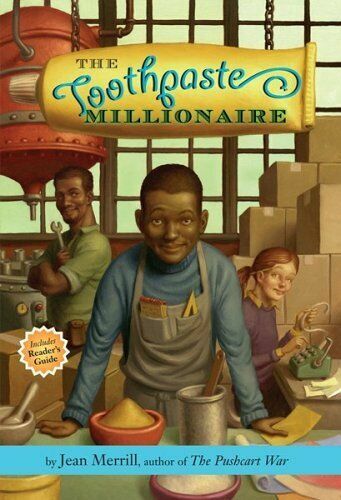 The Toothpaste Millionaire is a classic! Your family will have fun reading and having discussions on a variety of topics including entrepreneurship, economics, personal finance and math.